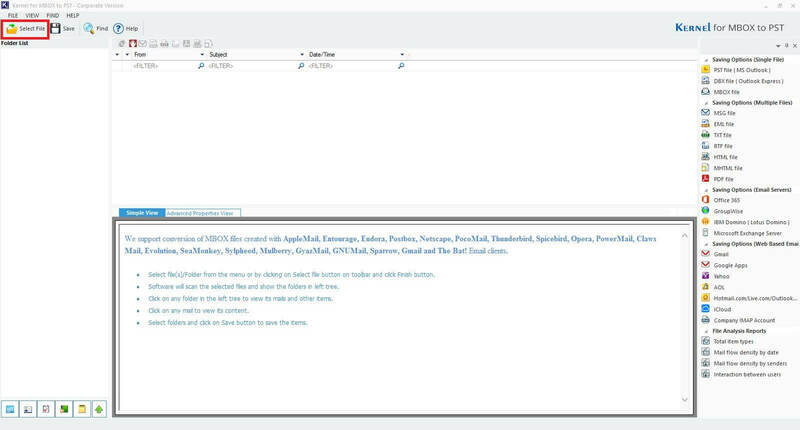 MBOX is a popular mailbox file format used by email clients such as Thunderbird, Eudora, PocoMail, etc. for storing email data. Apple Mail (it is an email client of Mac OS X 10.0 or later versions) also has MBOX for mailbox files. Can MBOX files be access in Outlook 2016 & 2013? 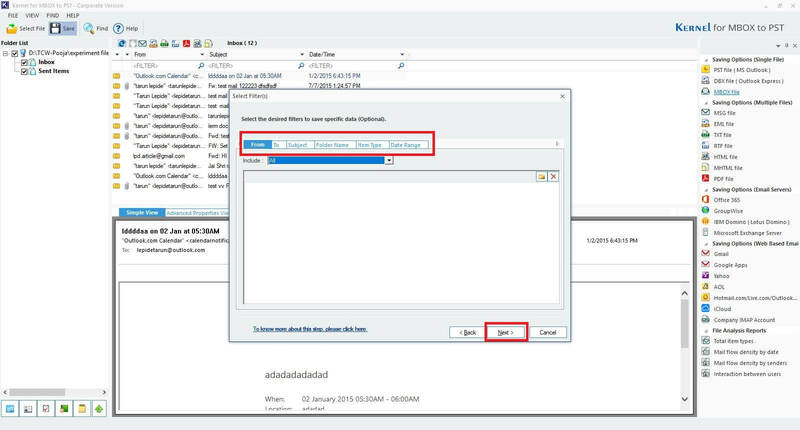 The major drawback of MBOX format is that Outlook does not recognize this format. As there is no direct way for importing MBOX files to Outlook, we need to convert MBOX files to MS Outlook files i.e., PST file format for any version of MS Outlook be it 2016 or 2013 or any other. Download the trial version (with limited MBOX to PST conversion facility) or go for the licensed version (that offers unlimited email migration). After installing, Launch Kernel for MBOX to PST. The following main screen will appear after launching. Click Select File. Step 2: Now, on the following screen you will notice 20 email clients supported by the software. Next, click on Browse to select an MBOX files. 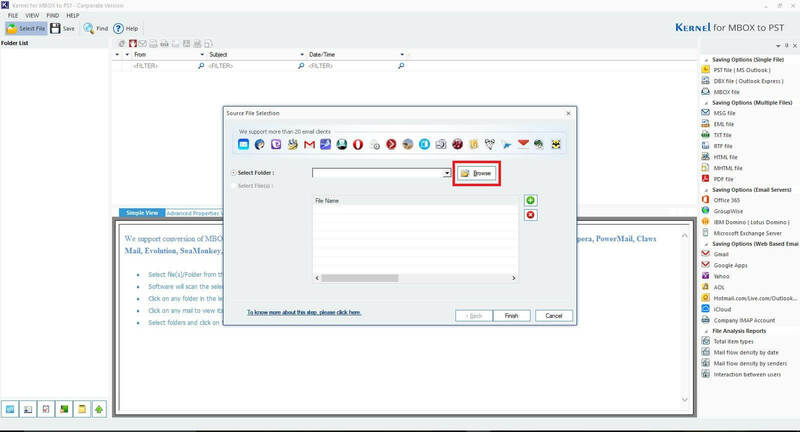 Step 3: Proceed further and select the folder where the MBOX file is saved. 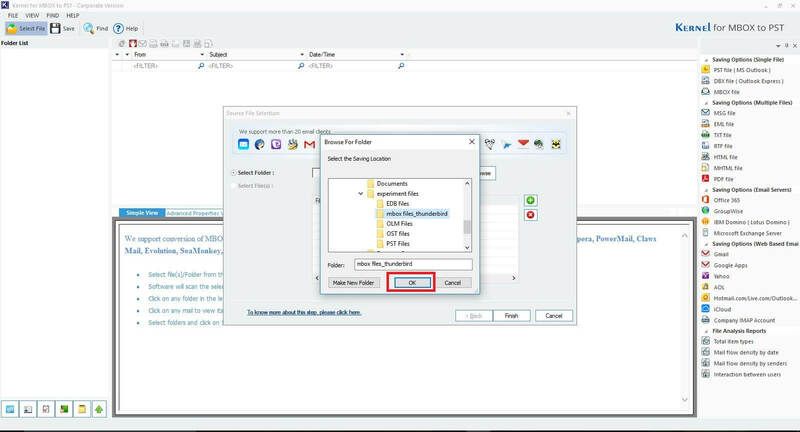 Click OK after selecting the folder with MBOX file that needs to be converted. Step 4: Following screen will appear. Click Finish to proceed with the conversion process. Step 6: Users can select desired filters according to the requirements. Click Next after selecting the required filters. Step 7: The next window offers PST split option – users can split Output PST files into many files. Provide the required PST file size. Click Next. Step 8: Now, click on Browse button and select the location to save the PST file/files and click Finish to end the process. 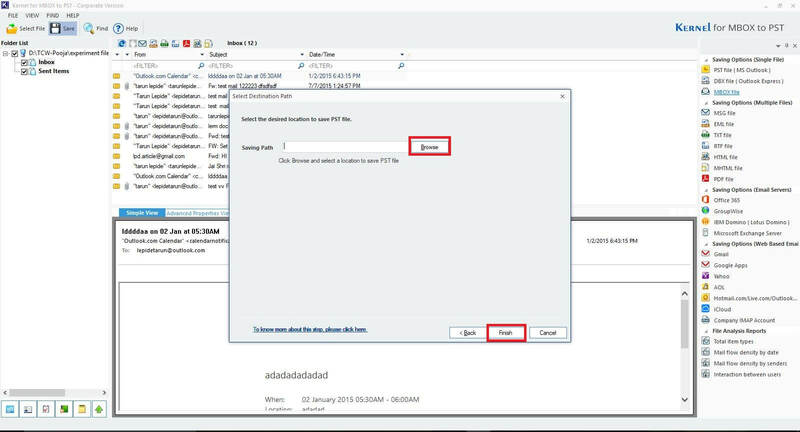 A dialogue box with saved file path will appear on the screen, click OK and a healthy PST file is waiting at the mentioned location. Now that you have converted MBOX to PST and also know the location of PST file, you can import the PST files to Outlook 2016/2013. These steps will remain somewhat similar for any version of MS Outlook. 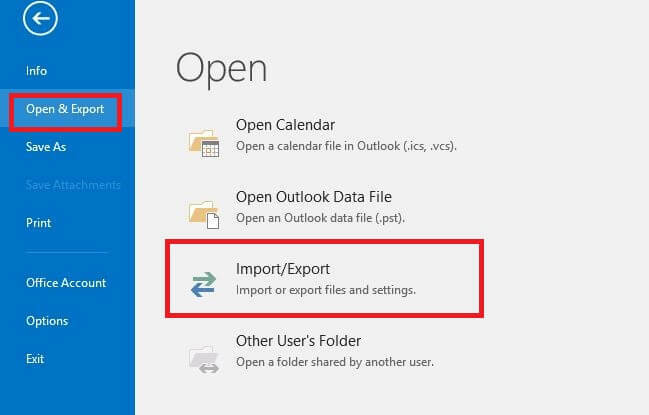 Launch MS Outlook, go to File, and select Open & Export and then choose Import/Export as shown in the screenshot below. Now, follow the screen instructions. After the import, your MBOX data is now ready for preview in MS Outlook 2016 or 2013 or earlier versions of your choice. The procedure described above is easy for non-technical users as well. The MBOX to PST conversion has become a straightforward, quick and non-cumbersome process with help of MBOX to PST Converter utility. 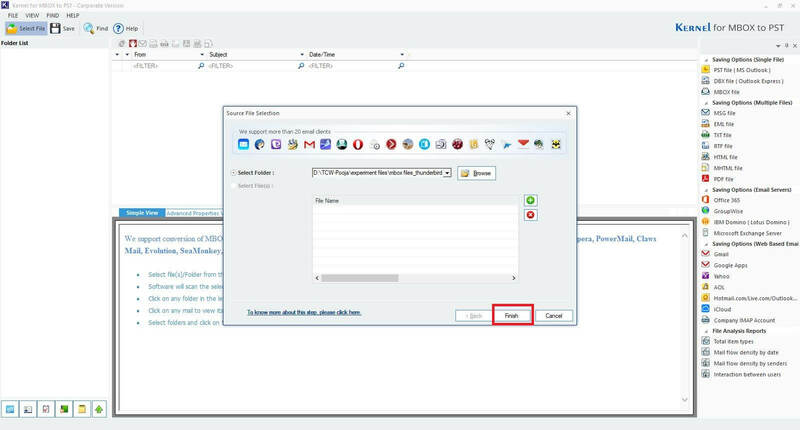 To read MBOX emails in Outlook, one needs to convert MBOX files to PST format. 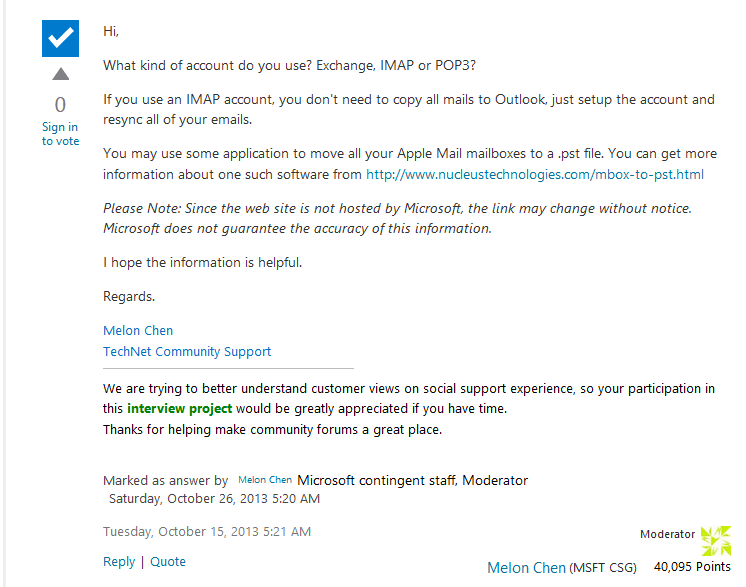 As it is not possible to import MBOX file directly to Outlook, we recommend you to try a third-party tool or the same.